Harley Quinn is a flamboyant super-villain and an adversary of Batman usually recognized as the Joker's girlfriend, although she has had her own strong solo career. Born Harleen Quinzel, she had been working as a psychiatrist at Arkham Asylum where she was assigned to the Joker and fell in love with him. This led to her adopting her own costumed persona, adapting the word harlequin, to assist him escape and cause further mayhem. Their relationship is passionate and continuously off-on, with Harley's best friend Poison Ivy constantly encouraging her to break up with for good. 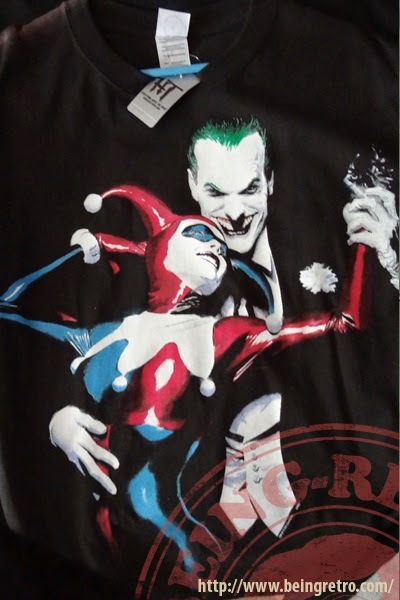 However, Harley's love for the Joker eventually brings her back to his side with the Joker himself demonstrating a keen need for her despite himself. When not with the Joker, she has been working mostly on her own in Gotham City, sometimes teaming up with her other friends. Her special abilities include an enhanced physiology due to chemical experimentation, giving her increased strength, agility and durability. She has been a member of the Secret Society of Super-Villains, the Secret Six and the Gotham City Sirens. Harley Quinn was originally created by Paul Dini and Bruce Timm as a character in the DCAU. Her first appearance was in the Batman: The Animated Series episode "Joker's Favor." (1992) Several years later, her first appearance in regular continuity took place in the graphic novel Batman: Harley Quinn. (1999). Wonder why they left her out of the movies? I think that's one of my favorite paintings of them. Very classy. Mr J seems quite happy!